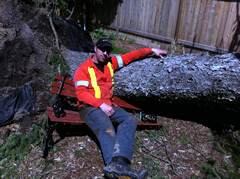 Brian Alkemade has over 20 years experience and is an ISA Certified Arborist ( ON1111-A ), a provincially Certified Arborist and a provincially Certified Utility Arborist with a diploma in horticulture. He is also a certified Tree Risk Assessor. Shorthills Tree Service is also member of the ISA and the IHSA (formerly EUSA). Contact us for your free estimate. We quote all sized jobs. We take customer satisfaction seriously. If we didn't, we would not still be in business. We work closely with our clients throughout all phases of the job, large or small. We provide pre and post construction plans and tree appraisals. © Shorthills Tree Service Inc. All rights reserved.